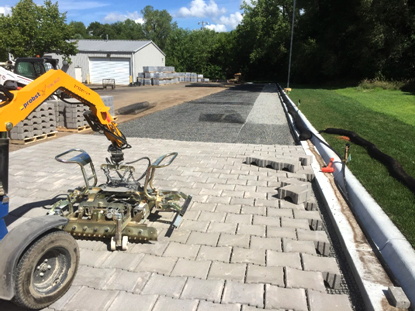 In August 2016 the Mahtomedi School District began a pavement reconstruction process of their existing parking lots and driveways at O.H. Anderson Elementary School and District Office. The existing pavement surface was in need of replacement, which also provided an opportunity to improve parking lot drainage and water quality discharge from both properties. 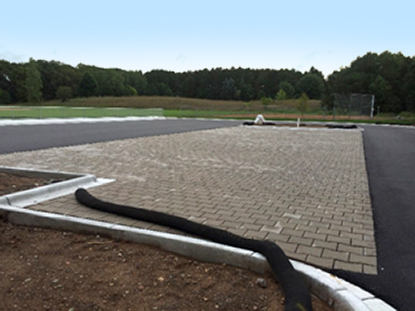 David Rey, Civil Engineer with Anderson-Johnson, worked with the school district to identify permeable pavement options and determined PaveDrain® as the best long-term solution. The PaveDrain system is designed as an open joint concept and does NOT require aggregate between the joints. 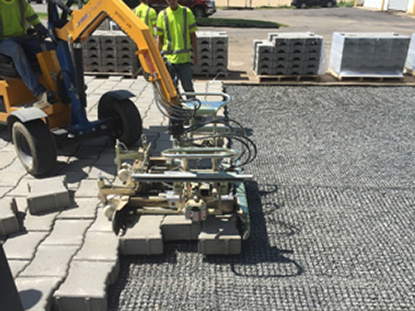 Although the initial construction cost was more than traditional permeable systems, this open joint feature provided district officials a cost effective long-term maintenance plan. Similar to many construction projects, weather related issues caused delays and the project was in jeopardy of not being ready when school started. Unlike traditional pavements, PaveDrain's open graded base aggregate allowed installation regardless of rain events or saturated soils. Structures Inc from Shakopee, MN installed the PaveDrain system using a PaverMAX Probst 301 and a Mini Excavator with a Probst Clamp. It was the first mechanical installation of PaveDrain in MN. The PaveDrain system came palletized with 11 square foot layers and was easy to install. Structures Inc installed all 35,000 square feet in just 7 days!